What is an Anti Reflection coating? Patients often don’t know what an anti-reflection coating is and if they do they seem to remember it as “the anti-glare thing”. I often hear “it just comes off” or it “makes my glasses dirty”. There is a lot of misconception on this essential and very much necessary coating that has come into a bit of disrepute lately. A regular lens reflects roughly up to 8 percent of light which means only about 92 percent gets through the lens. 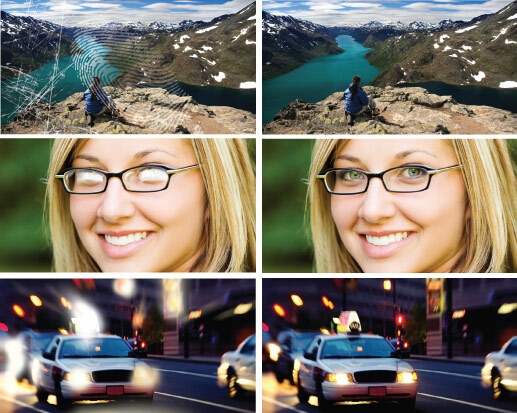 Higher index lenses can reflect up to 15 percent. In essence this means that the eye has less available light available for vision. This will become troublesome in low light conditions or at night – particularly night driving. Besides the lenses not letting all light through, you will catch reflections on the back of the lenses while wearing your glasses, which appear to be a smudge of some sort and can hinder your vision. Today's modern anti-reflective coatings can virtually eliminate the reflection of light from the lenses, allowing 99.5 percent of available light to pass through the lenses and enter the eye for clearest possible vision. This means the coating reduces glare on both sides – thus making the lens more see through and people looking at you can see your eyes and facial expression, making the lenses almost invisible. Your vision will be sharper especially at night and night driving and provide greater comfort during hours and hours of working at a computer. There are different “strengths” of the antireflection coating and that usually determines the price. To understand this it is important to know how the coating is applied. Applying anti-reflective coating to eyeglass lenses is a highly technical process involving vacuum deposition technology. The first step in the AR coating process is to meticulously clean the lenses and inspect them for visible and microscopic surface defects. Even a tiny smudge, piece of lint or hairline scratch on a lens during the coating process can cause a defective AR coating. Typically, a production line includes multiple washing and rinsing baths, including ultrasonic cleaning to remove any traces of surface contaminants. This is followed by air drying and heating of the lenses in special ovens to further remove unwanted moisture and gases from the lens surface. The lenses are then loaded into special metal racks with spring-loaded openings so the lenses are held securely but with virtually all lens surfaces exposed for the coating application. The racks are then loaded into the coating chamber. The door of the chamber is sealed, and the air is pumped out of the chamber to create a vacuum. While the lens racks are rotating in the coating chamber, a power source within the machine focuses a beam of electrons onto a small crucible that contains a series of metal oxides in separate compartments. When bombarded by the beam of this electron "gun" in succession, the metal oxides are transformed into vapors that fill the coating chamber and adhere to the lenses in a specific order to form a precise multilayer AR coating. Each AR coating manufacturer has its own proprietary formula, but generally all anti-reflective coatings consist of multiple microscopic layers of metallic oxides of alternating high and low index of refraction. Anti-reflective coatings are incredibly thin. The entire multilayer AR coating stack generally is only about 0.2 to 0.3 microns thick, or about 0.02 percent (two one-hundredths of 1 percent) of the thickness of a standard eyeglass lens. Depending on the formula and how many layers are applied to the lens will determine the time it takes and also the price. So don’t be surprised to get many different quotes on what seems to be the same product because it is not necessarily the same.